Sirolimus (INN/USAN), also known as rapamycin, is an immunosuppressant drug used to prevent rejection in organ transplantation; it is especially useful in kidney transplants. A macrolide, sirolimus was first discovered as a product of the bacterium Streptomyces hygroscopicus in a soil sample from Easter Island an island also known as "Rapa Nui", hence the name. It is marketed under the trade name Rapamune by Wyeth. Sirolimus was originally developed as an antifungal agent. However, this was abandoned when it was discovered that it had potent immunosuppressive and antiproliferative properties. Unlike the similarly-named tacrolimus, sirolimus is not a calcineurin inhibitor. However, it has a similar suppressive effect on the immune system. Sirolimus inhibits the response to interleukin-2 (IL-2) and thereby blocks activation of T- and B-cells. In contrast, tacrolimus inhibits the production of IL-2. The mode of action of sirolimus is to bind the cytosolic protein FK-binding protein 12 (FKBP12) in a manner similar to tacrolimus. However, unlike the tacrolimus-FKBP12 complex which inhibits calcineurin (PP2B), the sirolimus-FKBP12 complex inhibits the mammalian target of rapamycin (mTOR) pathway by directly binding the mTOR Complex1 (mTORC1). mTOR is also called FRAP (FKBP-rapamycin associated protein) or RAFT (rapamycin and FKBP target). FRAP and RAFT are actually more accurate names since they reflect the fact that rapamycin must bind FKBP12 first, and only the FKBP12-rapamycin complex can bind FRAP/RAFT/mTOR. The chief advantage sirolimus has over calcineurin inhibitors is that it has low toxicity towards kidneys. Transplant patients maintained on calcineurin inhibitors long-term tend to develop impaired kidney function or even chronic renal failure; this can be avoided by using sirolimus instead. It is particularly advantageous in patients with kidney transplants for hemolytic-uremic syndrome, as this disease is likely to recur in the transplanted kidney if a calcineurin-inhibitor is used. However, on October 7 2008, the FDA approved safety labeling revisions for sirolimus to warn of the risk for decreased renal function associated with its use. Sirolimus can also be used alone, or in conjunction with calcineurin inhibitors and/or mycophenolate mofetil, so as to provide steroid-free immunosuppression regimes. However, impaired wound healing and thrombocytopenia is a possible side effect of sirolimus; therefore, some transplant centres prefer not to use it immediately after the transplant operation, instead administering it only after a period of weeks or months. Its optimal role in immunosuppression has not yet been determined, and is the subject of a number of ongoing clinical trials. In a 2009 study, the lifespans of mice fed rapamycin were increased between 28-38% from the beginning of treatment, or 9-14% in total increased maximum lifespan. Of particular note, the treatment began in mice aged 20 months, the equivalent of 60 human years. This suggests the possibility of an effective anti-aging treatment for humans at an already-advanced age, as opposed to requiring a lifelong regimen beginning in youth. However, because it strongly suppresses the immune system, the drug cannot be easily used by humans. While the mice in the study were housed in pathogen-free facilities, people taking rapamycin are very susceptible to life-threatening infections, and require constant medical supervision. The anti-proliferative effect of sirolimus has also been used in conjunction with coronary stents to prevent restenosis in coronary arteries following balloon angioplasty. The sirolimus is formulated in a polymer coating that affords controlled release through the healing period following coronary intervention. Several large clinical studies have demonstrated lower restenosis rates in patients treated with sirolimus eluting stents when compared to bare metal stents, resulting in fewer repeat procedures. A sirolimus-eluting coronary stent is marketed by Cordis, a division of Johnson & Johnson, under the tradename Cypher. It has been proposed, however, that such stents may increase the risk of vascular thrombosis. Additionally sirolimus is currently being assessed as a theraputic option for autosomal dominant polycystic kidney disease (ADPKD). Case reports indicate that sirolimus can reduce kidney volume and delay the loss of renal function in patients with ADPKD. Sirolimus also shows promise in treating tuberous sclerosis complex (TSC), a congenital disorder that leaves sufferers prone to benign tumor growth in the brain, heart, kidneys, skin and other organs. After several studies conclusively linked mTOR inhibitors to remission in TSC tumors -- specifically subependymal giant-cell astrocytomas (SEGAs) in children and angiomyolipomas in adults -- many US doctors began prescribing sirolimus (Wyeth's Rapamune) and everolimus (Novartis's RAD001) to TSC patients off-label. Numerous clinical trials using both rapamycin analogs, involving both children and adults with TSC, are under way in the United States. Most studies thus far have noted that tumors often regrew when treatment stopped. Anecdotal reports that the drug ameliorates TSC symptoms such as facial angiofibromas, ADHD, and autism remain unproven. The anti-proliferative effects of sirolimus may have a role in treating cancer. Recently, it was shown that sirolimus inhibited the progression of dermal Kaposi's sarcoma in patients with renal transplants. Other mTOR inhibitors such as temsirolimus (CCI-779) or everolimus (RAD001) are being tested for use in cancers such as glioblastoma multiforme and mantle cell lymphoma. Combination therapy of doxorubicin and sirolimus has been shown to drive AKT-positive lymphomas into remission in mice. Akt signalling promotes cell survival in Akt-positive lymphomas and acts to prevent the cytotoxic effects of chemotherapy drugs like doxorubicin or cyclophosphamide. Sirolimus blocks Akt signalling and the cells lose their resistance to the chemotherapy. Bcl-2-positive lymphomas were completely resistant to the therapy; nor are eIF4E expressing lymphomas sensitive to sirolimus. Rapamycin showed no effect on its own. In a study of sirolimus as a treatment for TSC, researchers observed a major improvement regarding retardation related to autism. The researchers discovered sirolimus regulates one of the same proteins that the TSC gene does, but in different parts of the body. They decided to treat mice three to six months old (adulthood in mice lifespans); this increased the autistic mice's intellect to about that of normal mice in as little as three days. Rapamycin is a macrocyclic polyketide isolated from Streptomyces hygroscopicus that has been shown to exhibit antifungal, antitumor, and immunosuppressant properties. The biosynthesis of the rapamycin core is accomplished by a type I polyketide synthase (PKS) in conjunction with a nonribosomal peptide synthetase (NRPS). The domains responsible for the biosynthesis of the linear polyketide of rapamycin are organized into three multienzymes, RapA, RapB and RapC which contain a total of 14 modules (See figure 1). The three multienzymes are organized such that the first four modules of polyketide chain elongation are in RapA, the following six modules for continued elongation are in RapB, and the final four modules to complete the biosynthesis of the linear polyketide are in RapC. Then the linear polyketide is modified by the NRPS, RapP, which attaches L-pipecolate to the terminal end of the polyketide and then cyclizes the molecule yielding the unbound product, prerapamycin. The core macrocycle, prerapamycin is then modified (See figure 3) by an additional five enzymes which lead to the final product, rapamycin. First the core macrocycle is modified by RapI, SAM-dependant O-methyltransferase (MTase), which O-methylates at C39. Next, a carbonyl is installed at C9 by RapJ, a cytochrome P-450 monooxygenases (P-450). Then, RapM, another MTase, O-methylates at C16. Finally, RapN, another P-450 installs a hydroxyl at C27 immediately followed by O-methylation by Rap Q, a distinct MTase, at C27 to yield rapamycin. The biosynthetic genes responsible for rapamycin synthesis have been identified. As expected, three extremely large open reading frames (OFRs) designated as rapA, rapB and rapC encode for three extremely large and complex multienzymes, RapA, RapB, and RapC respectively. The gene rapL has been established to code for a NAD+ dependant lysine cycloamidase which converts L-lysine to L-pipecolic acid (See figure 4) for incorporation at the end of the polyketide. A gene rapP, which is embedded between the PKS genes and translationally coupled to rapC encodes for an additional enzyme, a NPRS responsible for incorporating L-pipecolic acid, chain termination and cyclization of prerapamycin. Additionally genes rapI, rapJ, rapM, rapN, rapO, and rapQ have been identified as coding for "tailoring" enzymes which modify the marcrcyclic core to give rapamycin (See figure 3). Finally, rapG and rapH have been identified to code for enzymes which have a positive regulatory role in the preparation of rapamycin through the control of rapamycin PKS gene expression. Biosynthesis of this 31-membered macrocycle begins as the loading domain is primed with the starter unit, 4,5-dihydroxocyclohex-1-ene-carboxylic acid, which is derived form the shikimate pathway. 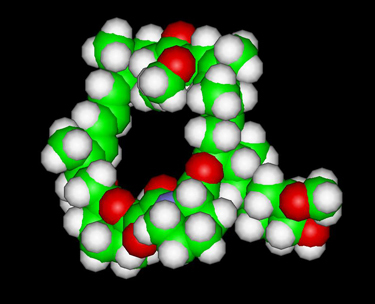 Interestingly, the cyclohexane ring of the starting unit is reduced during the transfer to module 1. The staring unit is then modified by a series of Claisen condensations with malonyl or methylmalonyl substrates which are attached to an acyl carrier protein (ACP) and extend the polyketide by two carbons each. After each successive condensation, the growing polyketide is further modified according to enzymatic domains which are present to reduce and dehydrate the polyketide thereby introducing the diversity of functionalities observed in rapamycin (See figure 1). Once the linear polyketide is complete, L-pipecolic acid which is synthesized by a lysine cycloamidase from an L-lysine is added to the terminal end of the polyketide by an NRPS. Then the NSPS cyclizes the polyketide giving prerarpmycin, the first enzyme free product. The macrocyclic core is then customized by a series of post-PKS enzymes through methylations by MTases and oxidations by P-450s to yield rapamycin. ^ a b Vzina C, Kudelski A, Sehgal SN (October 1975). "Rapamycin (AY-22,989), a new antifungal antibiotic.". J. Antibiot. 28 (10): 721-6. ^ Pritchard DI (2005). "Sourcing a chemical succession for cyclosporin from parasites and human pathogens". Drug Discovery Today 10 (10): 688-691. ^ Harrison DE, Strong R, Sharp ZD, et al. (8 July 2009). "Rapamycin fed late in life extends lifespan in genetically heterogeneous mice". Nature. Lay summary London Times (2009-07-08). ^ Jocelyn Rice (8 July 2009). "First Drug Shown to Extend Life Span in Mammals". Technology Review (Massachusetts Institute of Technology): 1-2. http://www.technologyreview.com/biomedicine/22974/page1/. Retrieved 2009-07-09. ^ "Cypher Sirolimus-eluting Coronary Stent". Cypher Stent. http://www.cypherusa.com/. Retrieved 2008-04-01. ^ Shuchman M (2006). "Trading restenosis for thrombosis? New questions about drug-eluting stents". N Engl J Med 355 (19): 1949-52. ^ Peces R, Peces C, PÃ©rez-DueÃ±as V, et al. (16 January 2009). "Rapamycin reduces kidney volume and delays the loss of renal function in a patient with autosomal-dominant polycystic kidney disease". NDT Plus (Oxford Journals) 2 (2): 133-135. ^ Tuberous Sclerosis Alliance (October 2009). Current Clinical Trials. http://www.tsalliance.org/pages.aspx?content=370. Retrieved 2009-10-14. ^ Sun SY, Rosenberg LM, Wang X, et al. (August 2005). "Activation of Akt and eIF4E survival pathways by rapamycin-mediated mammalian target of rapamycin inhibition". Cancer Res. 65 (16): 7052-8. http://cancerres.aacrjournals.org/cgi/content/full/65/16/7052. Retrieved 2009-07-08. ^ Chan S (2004). "Targeting the mammalian target of rapamycin (mTOR): a new approach to treating cancer". Br J Cancer 91 (8): 1420â€“4. ^ Wendel HG, De Stanchina E, Fridman JS, et al. (March 2004). "Survival signalling by Akt and eIF4E in oncogenesis and cancer therapy". Nature 428 (6980): 332-7. :10.1038/nature02369. 15029198. Lay summary - ScienceDaily (2004-03-18). ^ Novak, Kristine (May 2004). "Therapeutics: Means to an end". Nature Reviews Cancer 4: 332. http://www.signaling-gateway.org/update/updates/200405/nrc1349.html. Retrieved 2009-07-08. ^ Ehninger D, Han S, Shilyansky C, et al. (August 2008). "Reversal of learning deficits in a Tsc2+/- mouse model of tuberous sclerosis". Nat. Med. 14 (8): 843-8. Lay summary Scientific American (2008-06-25). ^ a b c Schwecke T, Aparicio JF, MolnÃ¡r I, et al. (August 1995). "The biosynthetic gene cluster for the polyketide immunosuppressant rapamycin". Proc. Natl. Acad. Sci. U.S.A. 92 (17): 7839-43. ^ Gregory MA, Gaisser S, Lill RE, et al. (May 2004). "Isolation and characterization of pre-rapamycin, the first macrocyclic intermediate in the biosynthesis of the immunosuppressant rapamycin by S. hygroscopicus". Angew. Chem. Int. Ed. Engl. 43 (19): 2551-3. ^ Gregory MA, Hong H, Lill RE, et al. (October 2006). "Rapamycin biosynthesis: Elucidation of gene product function". Org. Biomol. Chem. 4 (19): 3565-8. ^ Graziani EI (May 2009). "Recent advances in the chemistry, biosynthesis and pharmacology of rapamycin analogs". Nat Prod Rep 26 (5): 602-9. ^ Aparicio JF, MolnÃ¡r I, Schwecke T, et al. (February 1996). "Organization of the biosynthetic gene cluster for rapamycin in Streptomyces hygroscopicus: analysis of the enzymatic domains in the modular polyketide synthase". Gene 169 (1): 9-16.